For thousands of years the offspring of Abraham, Isaac and Jacob have lived in the land of Israel, and have loved the City of Jerusalem, just as God has. Ancient kings built magnificent gardens in and around her walls. King Solomon himself was actually quite well known for crafting of such grandiose gardens in Jerusalem and beyond. As we read in Ecclesiastes 2:5-6, “I made myself gardens and orchards, and I planted all kinds of fruit trees in them. I made myself water pools from which to water the growing trees of the grove.” These gardens would have held many species of plants, almost certainly including the seven species known to reside in the King’s Valley of old—the Kidron Valley in Jerusalem—where Yeshua is prophesied to pass through on His way up to and through the ancient Golden Gate. These seven species were found to be important not only to the kings of old, but to the people as well. They were also important enough to be found written throughout the words of biblical prophecy. Today, that same importance can still be found in those currently living in and around the City of Jerusalem, and into all corners of Israel. Through artifacts recovered from our distant past—from mosaics in synagogues, to coins from our Jewish brothers—they all tell the tale of this love of God’s handiwork and His promises through the fruit of the vine… wheat, barley, grapes, olives, pomegranates, date palms, and figs. These were all so important to the children of Israel as we find that unlike the Roman coinage found from their occupation of Judea, the Maccabeans in the Bar-Kokhba revolts did not use the face of a man upon their coins, but images of the Temple, and even more commonly, many of the seven species. One such coin from the Bar-Kokhba revolts, found repeated for years with only minor alterations, had upon one side a cluster of grapes, and upon the other a date palm full of dates. This coin is often found saying inscribed in Hebrew, “For the Freedom of Jerusalem!” With this hope of freedom they decided upon the use of a date palm and grapes… no depiction of a leader, no grand display of splendor, simply a hope in God’s gifts and promises—the fruit of the vine. Top: (Photo Credit http://www.jewishvirtuallibrary.org/coins-from-the-second-revolt) This coin dates to 134/135CE. 18-21mm. Bronze. “For the Freedom of Jerusalem” is inscribed on one side. Bottom: (Photo Credit: Katelyn Rae Cribbs) Bar-Kokhba revolts coins featuring the palm on one side and grapes or a grape leaf on the reverse. Bronze. Other coins from such revolts, and even from peaceful times, were often replete with depictions of many of the seven species. Olive branches and olives were used as borders on many coins, as were Temple oil vessels that depicted holy and anointed olive oil that was to be used in the great seven-branched Temple menorah. Wheat and barley were often shown in groupings of three stalks on one side of a coin, or sometimes seen as single stalks or tied bundles. Three pomegranates growing from a single branch were shown on others. Occasionally a single grape leaf was used instead of a grape cluster, as can be seen on the reverse side of a coin featuring the date palm tree. Even today we see these ancient images, such as pomegranates, olive branches, and date palms used in Israel’s modern-day currency (see images below). All of these coins display God’s love through His creation, and His covenants to His people. As with Abraham… Jerusalem, Israel, and all her people, would be fruitful in the land. They would be like the very vegetation, multiplying and bringing forth good and sweet things (see Genesis 12:1-3 and 15:4, Numbers 10:29). (Photo Credit: http://www.jewishvirtuallibrary.org/coins-from-the-second-revolt) Bar-Kokhba revolt, 133/134 CE. Bronze. Olive branch wreath and Temple vessel for oil. The very fact that the children of Israel used many of the seven species for everyday items such as coins, as a reminder of hope, is quite astounding. Yet, they went beyond that. They also used images of the seven species in mosaics—often gracing their synagogues. The visual representation was not only an everyday reminder through the currency used, but also a holy one found in their synagogues on the Sabbath, and High Holy days. Pomegranates, grapes, and dates are among the most frequently seen of the seven species in mosaic form. Yet, all the species are still found (see images below). 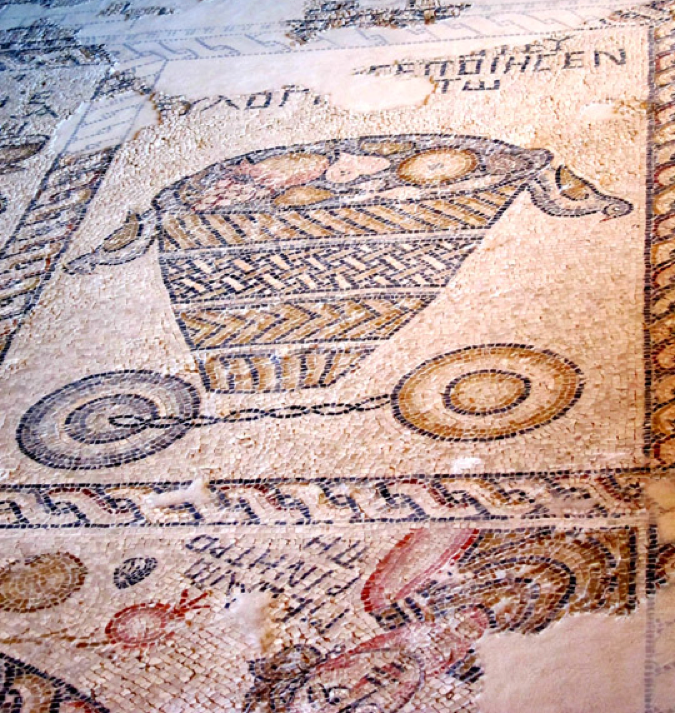 In a synagogue located in Sepphoris, Israel—or Tzippori—there is a certain mosaic that depicts grapes, pomegranates, figs and dates in a basket, ready to be given as a firstfruits offering to God (see Exodus 34:26, Ezekiel 44:30, Deut. 26:2, Prov. 3:9, etc.). Additionally, another mosaic in that same synagogue depicts wheat or barley being cut with a sickle and sheathed as the grain is ready to be harvested—prior to a portion to be given as a firstfruits offering. 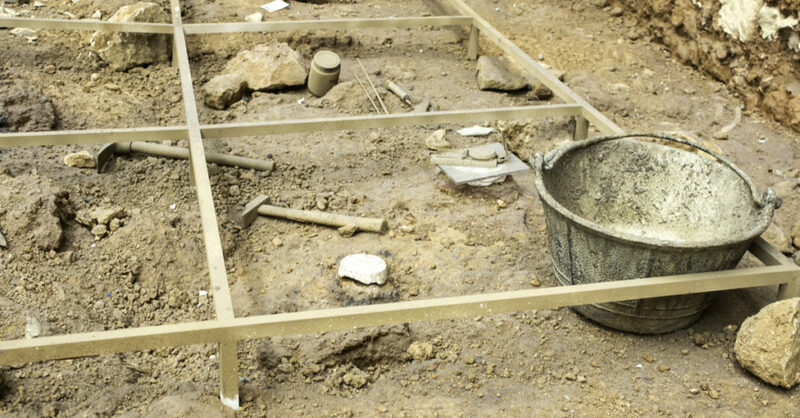 The elders and leaders of the synagogue, along with the rabbis and priests deemed these species so important that they specifically instructed and oversaw craftsmen as they laid the mosaic tiles into the very synagogue floors where they and the people came together before the Lord. (Photo Credit: daydreamtourist.com/2014/05/27/sepphoris-israel/) Mosaic from a synagogue in Sepphoris, Israel, depicting the giving of first fruits. 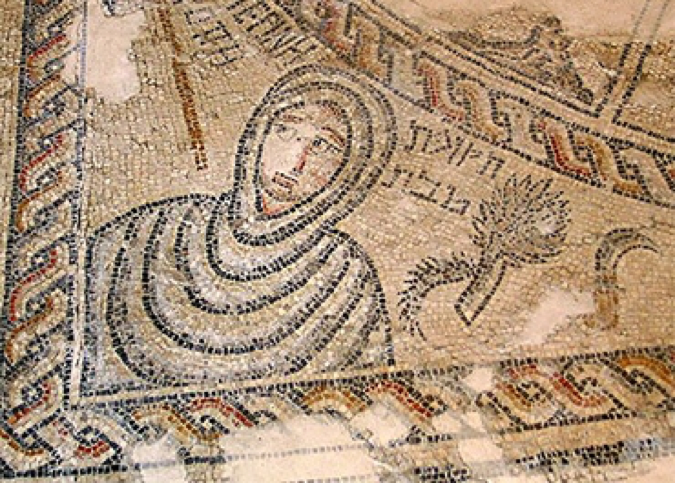 (Photo Credit: http://magazine.baruchhaba.com/bethlehem-of-galilee-cana-tsippori/) Mosaic from a synagogue in Sepphoris, Israel. The fact that those who love God should love the fruit of the vine, the branch, and the earth enough to place these images ever before their eyes, gives us a mere glimpse into the importance of these blessings from God. Because the Word of God speaks repeatedly of giving firstfruits to Him, and blessing ourselves through remembering that He first blessed us, then indeed they must be important. So it was with God’s people in the days of old, as the seven species were seemingly the most important of these firstfruits. Many ancient synagogues throughout the land of Israel may not retain images of the giving of firstfruits, yet, many even today show us God’s gifts of the earth. Through wheat and barley, and again the fruit of the vine and branch, we see the importance of the seven species that filled the Valley of the Kings. Today, as in days of old, we are witnessing this importance, not only in Jerusalem, but also throughout the Promised Land. (Photo Credit: http://www.israelandyou.com/maon-synagogue/) Maon synagogue mosaic. Depicting grapes, date palms, etc. Throughout all of these examples we see the love of the people of Israel for God through the seven species. 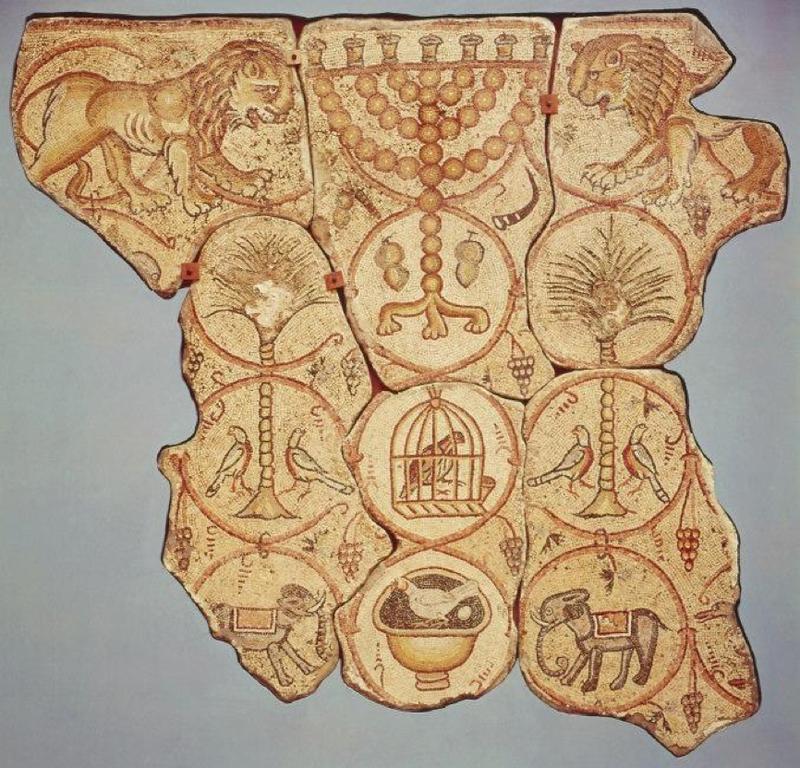 From Jerusalem where the coins of the land were chosen to depict these species and were subsequently struck, to their usage throughout Jerusalem and Israel, to mosaics in synagogues reaching from Jerusalem to all of Israel, their importance is continually seen. The people of Israel loved the seven species, not only because of their taste, resilience and appearance, but because they loved them as a sign of God’s promises and hope. They loved them because they were a gift from God… a fulfillment of His Word. Thousands of years ago the Kidron Valley—the Valley of the Kings—was filled with the fruit, branch, and stalk seen and loved throughout Jerusalem and all of Israel. Today, we are once again fulfilling Bible prophecy by bringing back the promise and hope to Jerusalem and Israel. Through the King’s Valley Seven Species Project, My Olive Tree is not only fulfilling Deuteronomy 8:7-8, but we are taking history itself from the images of the land and planting them into the ground… a living reminder of God’s goodness—His covenant fulfillment.